Simply Genie Designer Parties in a Box Rock Your Parties! Be the Coolest Party Host Ever with Simply Genie Designer Parties + HUGE $393 Value Giveaway! Want to host the coolest party ever? You absolutely NEED to check out Simply Genie! 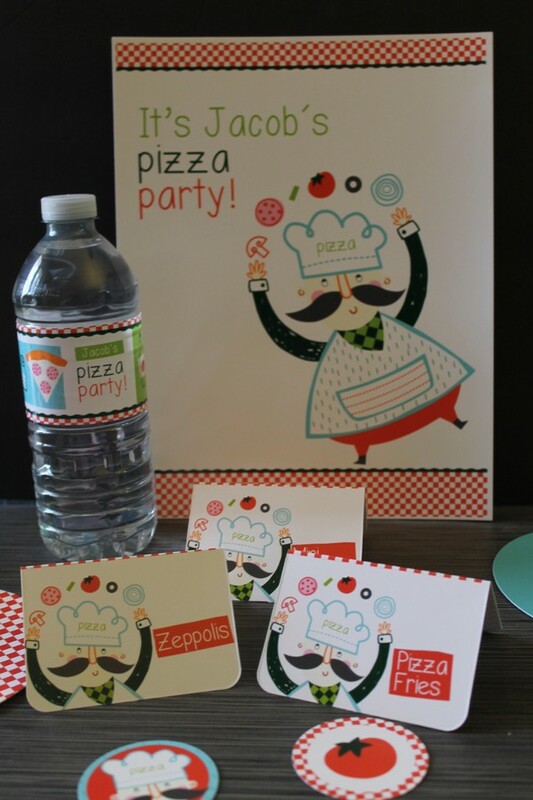 When they sent me their Pizza Party kit for review, I immediately fell in love with them. I know you will too! 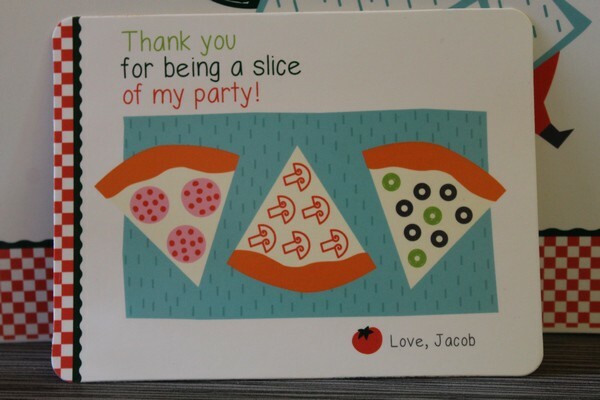 Let me say that I originally planned on actually having a pizza party for Jacob with these gorgeous supplies. Alas, he got really sick for over a week, then Easter came. I didn’t want to hold up the review, so I winged it during the family Easter party. The “cupcakes” are actually parfaits made by my cousin’s girlfriend. I kept the rest of the supplies to use for his birthday party in June. How will Simply Genie Rock Your Party? Simply Genie takes the “party in a box” concept and totally takes it to a whole new and totally unexpected level. I’m going to be honest, when I first saw the site, I wondered what made them different from other similar concepts. We’re talking some big name stores that do party in a box ideas. So how do they stand out? At first glance, I noticed that their party themes are the perfect combination of cute and classy, fun and stylish. While they’re geared more towards kids, I saw themes that work well for teens and even adults! 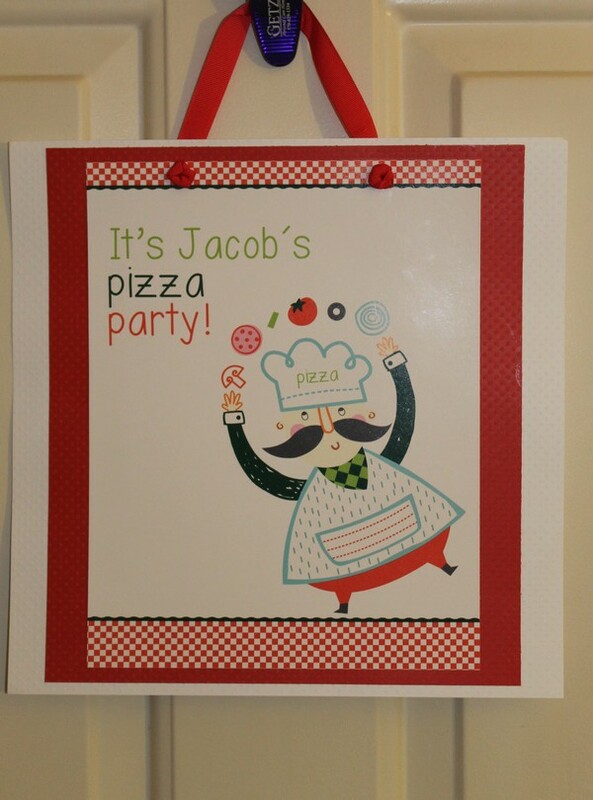 The Pizza Party theme, for example, works for many age groups and both boys and girls. The Spa Birthday Party in a Box theme would be beautiful for a teen girl or a Mother’s Day party. It’s really all in the customization. That’s where Simply Genie really excels: customization. To me, aside from the super cute and original themes, it really sets them apart. You don’t just slap your name on a few things and call it a day. 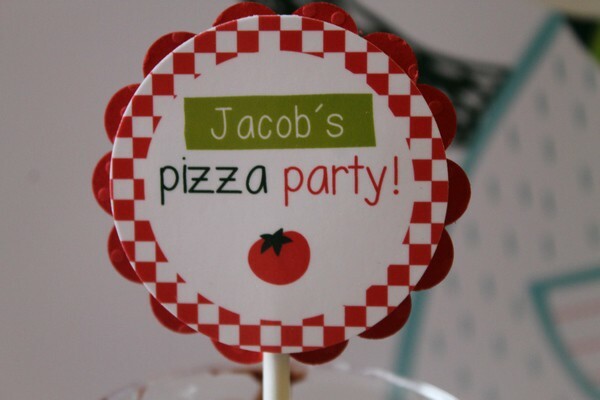 You can customize menus, water bottle labels, cupcake toppers, place cards, even thank you cards for after the party! The packages themselves are totally customizable as well. They offer a few basic options, but you can add on until your heart’s content and your package is exactly what you need for the best party ever. The sets already assume that children aren’t going to eat just one cupcake, for example. A Dazzling Package for 8 guests comes with 16 cupcake wrappers. It also comes with a few extra plates, napkins and other essentials for the inevitable tag-along guest. Simply Genie stands out from the “party pack” pack in other ways, too. They don’t just give you the elements you need for a great party, they really go the extra mile to wow you with them. Let’s start with the Happy Birthday banner. First, it’s not a cheap plastic or paper banner, but rather a thick cardstock paper that holds up really well. Second- and oh so beautifully- they PUT IT TOGETHER FOR YOU! This alone saves you so much time because you don’t have to sit there threading the letters through the ribbon and trying to get them just right. I may have wept tears of joy when I saw this! 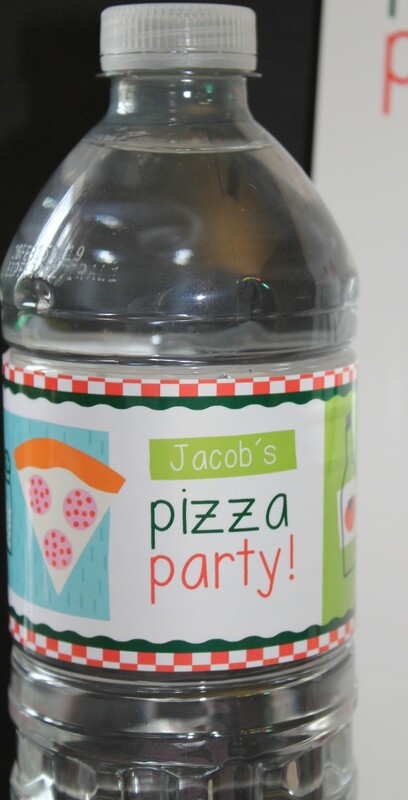 The water bottle wrappers are so cute that kids will actually WANT to drink water. 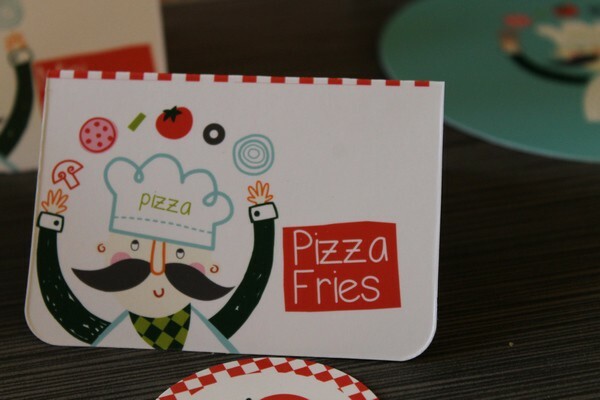 The menu cards are so cute! When you’re creating your party package, you just tell them what foods you plan to have. I planned to make pizza fries, mini calzones, pizza muffins and zeppolis. I still want to make those pizza muffins, so expect to see that recipe along with cupcake wrappers and toppers in all their glory very soon. Speaking of favors, when you’re on Simply Genie checking out the offerings for your favorite party theme, you’ll notice that you can also add premium favors to your order for an extra fee. 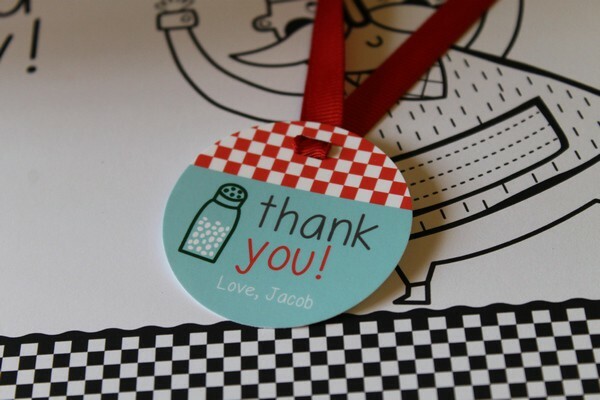 These favors are based on the age of your guests and they’re actually a beautiful small toy that the child will keep. We all know where most favors end up within a few days after a party, don’t we? Simply Genie’s favors are gifts, not cheap trinkets. So yes, they are pricey, but that’s why they’re called “premium favors,” and they are totally optional. Simply Genie has several different kit sizes, each with different customization options and add-ons. However, if you don’t see one that fits your needs, you can actually build your own completely custom party. You can change the colors of a theme, the wording…pretty much everything! Before we get to the giveaway, I want to show you a couple other favorite themes of mine! Ready to plan your next amazing party? Head to Simply Genie and check out all their stunning party kits! Check out their gorgeous Pinterest boards for inspiration on your favorite themes! Follow Simply Genie on Twitter and Facebook to keep up with all their exciting news. Planning a party of your own? You’ll LOVE this giveaway! Enter below for a chance to win a Designer Party in a Box ($393 value). It comes with everything you’ll need for 16 guests. While I found the personalization process easy, if you have any questions, the wonderful team at Simply Genie will help make sure your package is perfect for your party. Giveaway ends 4/30. Open to US residents. I am loving the Puppy Birthday Party Decor Kit! 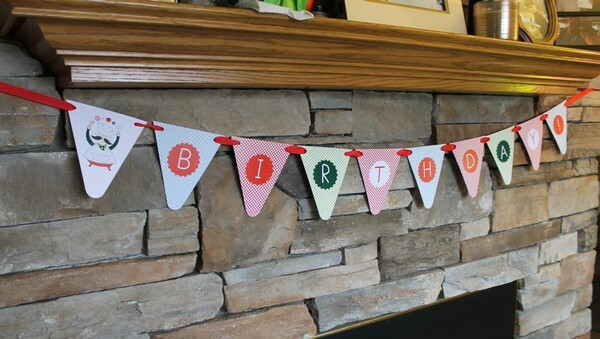 really like the First Birthday Party Decor Kit for Girls but they are all so cute! I love the Paris Themed Birthday Party Decor Kit! 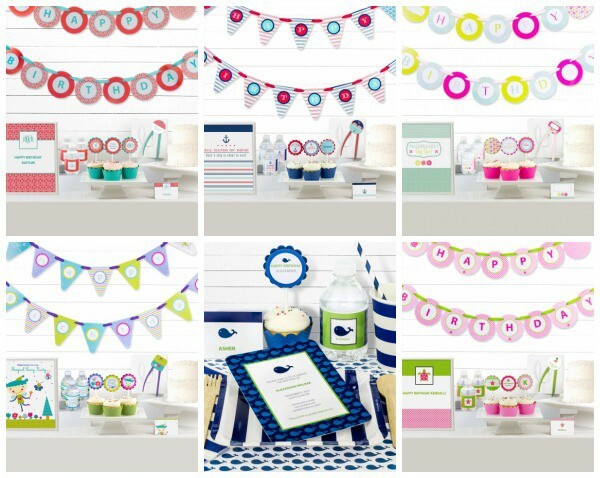 Nautical Birthday Party Decor Kit is adorable! So many cute ones to choose from! My favorite is the Coral Greek Key Monogram Birthday Party Decor Kit. I love the colors! I like the Quatrefoil Monogram Birthday Party Decor Kit. Thank you!